A weekend of indulgence had past, with a meaty BBQ party on Friday ending with walnut birthday cake, then a full feast of Chinese course dinner on Saturday and a decadent cheesecake that I would be confessing about, a chow-down on durians, all the way from Taiping, along with a whole day of shopping on Saturday followed by another feast of course and then some more of the leftovers durian, cold from the refrigerator. Now try beating this wonderful tummy-filled birthday weekend. In sum, I had a blast. The BBQ pictures will be up soon once I get the pictures from M, my 1984-recentlly-turned-housemate friend. As for the cheesecake that I mentioned about a confession, oh yes, I made a cake for my own birthday. That night it was a trio of celebration, where my sis, cousin and I celebrated, as we have our birthdays close together, spanning out in 10 days. 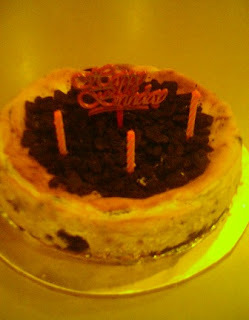 I decided to go full force indulgence for this once-a-year event, and decided to make Oreo Cheesecake. I got this recipe from Kraft’s website, which I had faith would turn out well. One bite into it, everybody says “Mmm, it’s good!’ My dad, who was always honest, he even commented on my not-risen-enough cake for my Grandma the last time, said I can give Secret Recipe a run of their money with this one. But half way through the cake, I started to get more comments. My sister’s boyfriend asked did I use blue cheese, and I was startled. I take a bite of the cake and oh no, I realized that something was wrong with my cream cheese. I confess, I used a block of cream cheese that had been, let’s say pretty long, maybe too long in my refrigerator. My mum and aunt decided the cheese was too heavy and did not finish their cake while my cousin though enjoyed it, wasn’t able to finish it either due to the ‘weird’ taste which became obvious after more than few bites. J can taste it right away, since he had so many of my cheesecakes before, and being a cheese lover himself. Only my dear Pho Pho, enjoyed her cake, this proving she’s a strong-cheese lover. As for me, let’s just say, the cake could have been good, the texture was great, the Oreos was yummy but the cream cheese was just, a little too cheesy, more for the savoury kind I might say. Anyhow, I would certainly try it again; I still think it is a good recipe. Ha-ha. So, let’s just call this my Blue Cheese Birthday Cake. How’s that. Anyway, the rest was finished later by J’s family and her sister even said it was not bad.